This latest themed edition of our magazine is devoted to questions involving literary translation – we have given it the title “Poetics in Translation”, which is clearly a paraphrasing of the “poetics of translation”, a term which was put forward half a century ago by Edward Balcerzan, and which has since become one of the sub-disciplines in the broader field of translation studies. Ewa Rajewska writes about his precursory role in the section titled Poetological Archive, stressing its echoing of that which in the 1970s took place in the west in the field of translation studies, which constituted its autonomy thanks to the works of Jamesa S. Holmes, Gideon Toury, Susan Bassnett, André Lefevre and the recently deceased Katherine Reiss (who co-created Skopos theory). Such theories were not widely accessible to Polish experts in translation, as the circulation of scientific discourse was disrupted by causes of a political, ideological, linguistic – or simply put – financial nature. In spite of their inability to enter into a discourse with foreign circles regarding issues involved translation, our own Polish studies of translation were doing very well at the time, something Forum of Poetics is happy to acknowledge today. And yet the formula of “poetics in translation” involves something other than a Balcerzanesque “poetics of translation”. Closer to its theoretical context are rather the “travelling” theories, discourses and concepts created by the likes of Edward Said, Mieke Bal and Susan Gal – in terms of these journeys, translations happen to be one of the key ways of travelling. Poetics also use translations as a means of transport, and the outcomes and range of these voyages happen to be quite different. 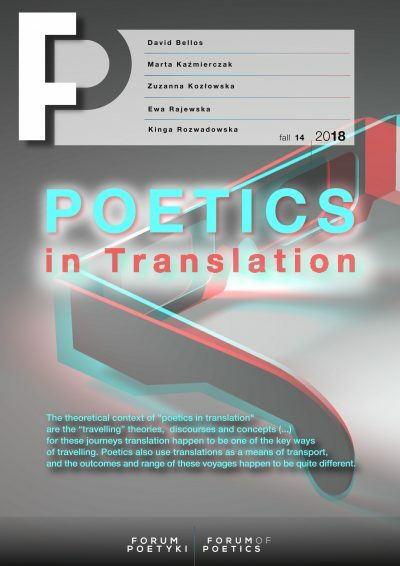 In this issue of Forum of Poetics we are also concerned with the poetics of otherness in translation and the strangeness of translation. An article written by David Bellos – one of the chapters from his brilliant book Is There a Fish in Your Ear (2011) – returns to the endless dilemma concerning familiarisation and exoticisation in translations, in order to then in a series of suggestive examples show specific solutions, with the aid of which translators try to retain traces of the “foreign-soudingness” of the source text in the target language. A study penned by Kinga Rozwadowska enters into an interesting dialogue with Bellos’ reflections; it is titled Polskie, czyli obce (Polish, therefore foreign), dealing with a famous fragment of Brothers Karamazov in which Fiodor Dostoevsky included Polish characters shown episodically in a negative light. Showing in Polish the way in which these protagonists speak was for numerous translations of this Dostoevsky text a real challenge. Another canon modernist work – the poem The Love Song of Alfred J. Prufrock by T.S. Eliot – is dealt with by Marta Kaźmierczak, who in her fabulous micro-analyses presents the history behind the Polish series of this work, putting forth an original way of analysing the quality of its translation. A text by Marta Stusek deals with Polish journeys into the poetics of Japanese haikus, while Zuzanna Kozłowska deals with translatological concepts involving the works of Vladimir Nabokov and Douglas Robinson, in order to point towards an intriguing phenomenon involving the synaesthetic sense of language and its influence upon feeling a “pleasure in translation”. The current edition of Forum of Poetics also involves a discussion around two relatively new books, and though they are completely different in terms of genres, both deal with the topic of translation. One of these is a work reviewed by Borys Szumański – a collection of twelve conversations with Polish translators recorded by Adam Pluszka (Wte i wewte. Z tłumaczami o przekładach – There and elsewhere. Talking with translators about translation), a work which fits into an ever growing trend of focusing on the person and the work of translators in the communication and culture of translation. The second book, presented by Weronika Szwebs, is Reflections on Translation Theory. Selected Papers 1993-2014 by Andrew Chesterman, one of the most renowned contemporary theoreticians in the field of translation, the author of (among others) the original notion of “memes of translation”. Finally, in the section titled Poetological dictionary, we include the phrase “translation universals” penned by Ewa Kraskowska and referring to the widely debated concept by Mona Baker. Translation studies has in recent decades become a field of intense evolution in terms of substance and methodology. New fields of research are appearing all the time, and the traditional philological ways of working are enriched by modern tools and theoretical elements. This new edition of Forum of Poetics is intended to be part of this key field of exploration in the contemporary humanities.